You are trying to leave for work, but your garage door won’t open. That’s when you see it: the broken spring on your garage door. Don’t panic: Crawford and Brinkman can help. Found a Broken Spring on Your Garage Door? Your garage door spring is broken and you need to get to get to work. Do you feel like the universe is conspiring against you to make you late? 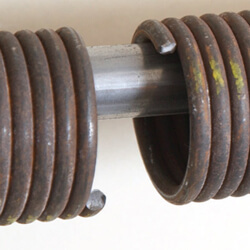 Although it might feel like you’re the first to have a garage door spring break, actually garage door springs are one of the most common repairs in the garage door industry. Here’s why: Garage door springs support the entire weight of the garage door. The springs are wound or stretched under pressure, tightening and loosening as you open or close the garage door. It is the garage door springs (not the garage door opener itself) that supports and lifts the hundreds of pounds that your garage door weighs. And just like anything else under pressure, eventually your springs will reach a breaking point and will need replacing. Especially when it gets colder out, you will see garage door springs break more often. If one of your garage door springs has broken, it’s wise to replace all of them at once. Why? Usually, garage door springs are installed at the same time. So it follows that since they experience similar aging and weathering, your other door springs are likely to break soon as well. Sure, you could wait until the other spring breaks on its own. But do you really want a repeat of this morning? Do you really want to run through the hassle of repairing a broken spring again? We advise against it. We also have seen that having a new and old spring on your garage door throws off the balance of the door. You may burn out the motor on your garage door opener if your springs aren’t of the same caliber. Contact Crawford and Brinkman today!